Three new iPhones are expected this year, along with modem, memory, camera and battery life improvements. It's that time of year again for Apple (AAPL - Get Report) fans. On Wednesday, September 12 at 1 p.m. ET, Apple is holding an event at its Cupertino, CA headquarters at which it will announce new products and software. New iPhones are of course expected; according to some reports, they might be named the iPhone XC, iPhone XS and iPhone XS Plus. And if some recent reports are on the mark, Apple will also unveil Face ID-capable iPad Pros and Apple Watches with larger screens. TheStreet will be live-blogging Apple's latest iPhone unveiling event on Wednesday, which begins at 1 p.m. ET. Please check our home page for more details. Though it took longer with the iPhone X last year due to production delays, Apple often begins taking pre-orders for its newest iPhones on the Friday after its launch event, and begins delivering them a week later. 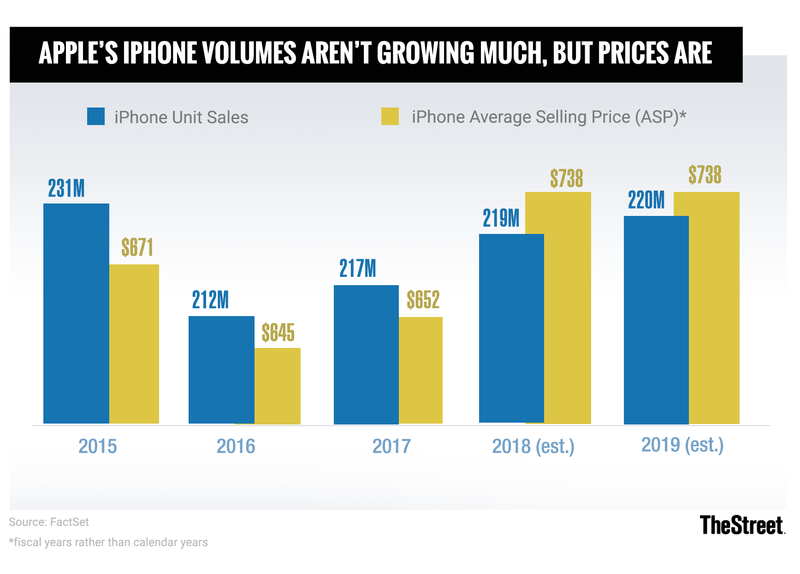 Should that be the case, Apple would have a little over a week to record sales for new iPhones during its fiscal fourth quarter. Read RealMoney's take on Apple's stock and how to play the trade wars news. Based on what has been reported to date, here's what to expect from Apple's iPhone reveal. A number of reports state that Apple plans to unveil three new iPhones in September: 5.8-inch and 6.5-inch iPhone X successors sporting OLED displays -- there's some debate about what the phones will be named -- and a cheaper, 6.1-inch, LCD-based iPhone. Like its OLED siblings, the LCD-based iPhone is expected to support Face ID and feature an edge-to-edge display. However, like the standard iPhone 8, it's expected to have just one rear camera rather than two, and it will also reportedly have an aluminum frame rather than a stainless steel one. According to some reports, the LCD iPhone will begin shipping a little later than the OLED models. As usual, Apple is expected to put a brand-new processor (expected to be called the A12, or something similar) inside of its latest iPhones. Taiwan Semiconductor (TSM - Get Report) , which has been manufacturing Apple's A-series processors in recent years, is believed to have the honors once more. Whereas the A11 Bionic processor found inside of last year's iPhones uses a 10-nanometer manufacturing process, this year's processor believed to rely on TSMC's next-gen 7-nanometer process. A memory boost is also expected. The new OLED iPhones will reportedly contain 4GB of RAM, and the LCD iPhone will reportedly have 3GB. For comparison, the iPhone X and 8 Plus contain 3GB of RAM, and the standard iPhone 8 has 2GB. This is an incremental positive for Micron (MU - Get Report) and other memory makers. Analyst Ming-Chi Kuo, whose Apple reporting over the years has been fairly accurate, has predicted that both the new LCD iPhone and the 6.5-inch OLED iPhone (but not the 5.8-inch OLED model) will support dual SIMs. This is a feature that's popular in many emerging markets where users often rely on multiple carriers, as well as with some business users. After using both Qualcomm's (QCOM - Get Report) Snapdragon X16 modem and Intel's (INTC - Get Report) XMM 7480 modem within last year's iPhones (which modem was used depended on the particular model), Apple is expected to solely rely on Intel's XMM 7560 modem to provide mobile connectivity for this year's iPhones. While the Snapdragon X16 supports gigabit peak 4G download speeds (Gigabit LTE), the XMM 7480 doesn't. As a result, Apple chose to throttle the X16's performance rather than have some iPhones deliver faster download speeds than others. Since all of this year's iPhones are expected to use the XMM 7560, which supports Gigabit LTE, that shouldn't be an issue this time around. Whereas many of the new features delivered by an iPhone refresh are usually leaked ahead of the launch event, Apple generally does a better job of keeping pricing details from getting out in advance. With that said, there have been reports stating that Apple will give its new OLED iPhones $999 and $899 starting prices, respectively, while charging a little less for the LCD iPhone. Should this happen, Apple's new 5.8-inch OLED iPhone would cost $100 less than the iPhone X, which also sports a 5.8-inch display. That could go over well in foreign markets where -- thanks to taxes and/or tariffs -- the iPhone X's starting price has been well above $1,000. This is par for the course: Apple has improved camera quality from one iPhone generation to the next like clockwork. Among other things, last year saw the introduction of Apple's Portrait Lighting feature -- it works on the iPhone X and 8 Plus, with the X supporting it on the front camera in addition to the rear -- as well as 60 frames-per-second (fps) 4K video recording. Look for this year's iPhones to feature newer Sony (SNE - Get Report) image sensors, along with a fresh set of software-based camera improvements. There have also been reports that Apple is working on triple rear camera support -- some Android phones already support this feature -- but this might be a 2019 move rather than a 2018 one. The 6.5-inch OLED iPhone's size should allow Apple to pack a larger battery within it. Kuo believes the phone's battery will have a capacity of 3,300 to 3,400 mAh, which would be well above the iPhone X's 2,716 mAh. And for all three iPhones, the use of a processor made via TSMC's 7nm process should help with battery life. Though this could be partly offset by efforts to enhance the A12's performance relative to the A11's, TSMC asserts its 7nm process delivers roughly a 40% improvement in power consumption relative to its 10nm process.